While the Ebola threat has captured headlines, the World Health Organization (WHO) warns that dengue - while far less lethal - has become one of the fastest-growing global health threats, contracted by 50-100 million people each year. "The increase in dengue incidence and severity of the outbreaks is a global phenomenon, with a 30-fold increase over the past five decades," said Ahmed Jamsheed Mohamed, a doctor in the WHO's South-East Asia office, adding that eradication is "not seen as feasible in the near future". The disease is transmitted by the Aedes aegypti mosquito and causes debilitating flu-like symptoms, headaches, rashes and severe muscle and joint pains that earned its original name "breakbone fever". In serious cases, internal bleeding, organ damage and death can occur. While Ebola has killed nearly 5,000 people this year, mainly in west Africa, with an estimated 13,000 infections, dengue kills up to 20,000 annually, and 40% of the world's population live in dengue-risk areas. Endemic to warm, humid zones, dengue's range may also be spreading as infected travellers transport the virus and - scientists believe - as global warming expands the Aedes aegypti's range. 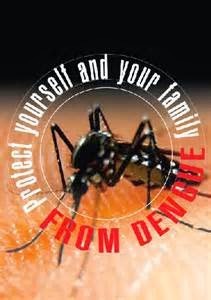 Japan this year experienced its first domestic outbreak in seven decades, while in the United States dengue remains rare but growing. "Climate change may also affect transmission, as dengue mosquitoes reproduce more quickly and bite more frequently at higher temperatures," Ahmed said. There is no vaccine or specific treatment. Dengue spreads via the bite of an Aedes aegypti that previously bit an infected person, making it difficult to control in densely populated tropical cities where standing water is common. Kuala Lumpur and its environs have been the epicentre of a Malaysian outbreak that has filled some hospitals to capacity and become the top public health concern, with residents trading advice on home remedies - crab soup, coconut milk and papaya leaf juice are currently in vogue. Malaysian cases have topped 85,000 through the end of October, tripling compared to the same period last year. Deaths also have tripled to around 150. Hapless officials have faced mounting pressure as the numbers climb despite campaigns to eliminate standing-water mosquito breeding sites, and copious fumigation. Elsewhere, Indonesia saw 121,000 cases in 2013, up 30%, with 871 dead. The virus is spreading from urban to rural areas. "This is a new trend we have seen in the past five years," health ministry official Soewarta Kosen said, adding rural health systems were unprepared. Dengue also is up in southern China, according to media reports there, and has reappeared in Hong Kong after a few years' absence. Brazil leads Latin American infections with seven million since 2000. Some 800 have died in the past five years. Brazil, Vietnam, Indonesia and Australia have released genetically engineered mosquitoes whose offspring are sterile in hopes of controlling the Aedes aegypti, but the method's efficacy remains unconfirmed. Dengue has four strains, and infection with a particular one leaves patients immune to that variety in future. But it also is believed to make some more susceptible to the other three, including a fast-growing strain with more severe symptoms and higher death rate that is gaining ground in Malaysia. Most dengue patients are hospitalised on IV drips and monitored as blood platelet counts drop, which can lead to dangerous internal bleeding. The majority recover within two weeks, but symptoms can persist. Development of effective drugs has been elusive, but after 20 years of research French drugmaker Sanofi says it is nearing completion of a vaccine it hopes to make commercially available late next year. A National University of Singapore team, meanwhile, is among those working on a possible drug to treat dengue. The researchers say they have managed to isolate dengue antibodies, and hope to start clinical trials in 2016.